How many have to die before it is unacceptable? Sweatshops. Bangladesh. There are always moves afoot to weaken if not undermine the most basic rights of workers one of which is in the area of occupational health and safety, a right won on the bodies of workers who died through the lack of basic safety measures. Companies give reasons to support this strategy, using such buzz words as: international competitiveness, increased productivity and other pearls. 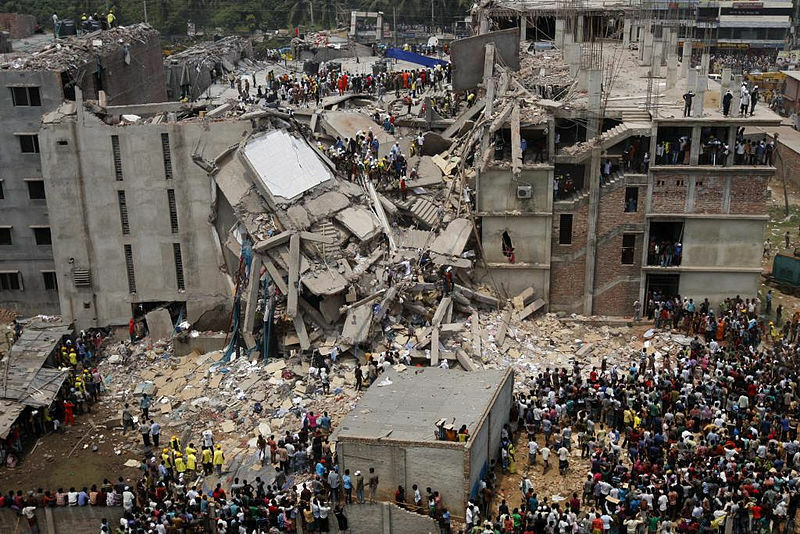 Rana Plaza garment factory collapses killing 1127 workers. Three weeks ago in the Rana Plaza garment factory in Bangladesh there was yet another ‘industrial accident’ causing the death of more than 1100 workers. Since then two international labour organisations with the assistance of Oxfam have organized an international agreement to improve fire safety and working conditions in Bangladesh. Designer labels, wholesalers and retailers who sell garments manufactured in Bangladesh are being asked to sign. Many have agreed but some large companies are refusing. Walmart is one. As of today those Australian companies who appear to be reluctant to participate are Woolworths (Big W), Kmart , Cotton On and Target. I wish I could say that this is the first major industrial fire or accident in the Bangladesh garment industry but it isn’t. It’s just the worst. I wish I could be confident in predicting it will be the last. I’m not in the least. I’ve previously written about the garment industry especially as a catalyst for change in the area of occupational health and safety. 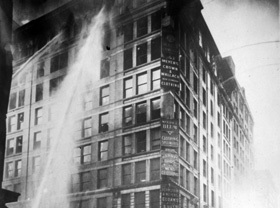 Two years ago New York commemorated the centenary of the Triangle Waist-Shirt factory fire in the Asch Building in New York. 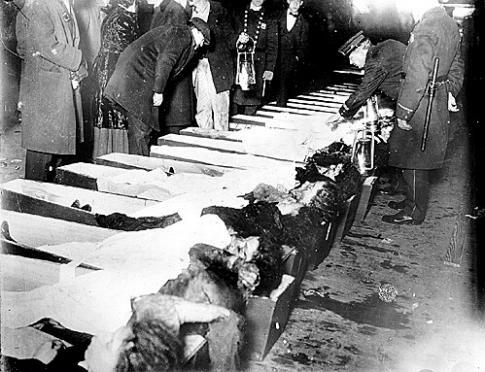 Victims of the Triangle waist shirt factory fire are lined up for inspection. 1911. That fire occurred in 1911 and over 100 people, mainly teenage migrant girls, were killed. The Triangle fire is remembered every year since, with a ceremony that includes the victims’ names being read out as a bell is rung. Close to the end of their shift one Saturday afternoon working girls were still at their machines in a Triangle factory that had wooden floors, covered with scraps of fabric discards, mixed with oil from sewing machines. A spark caused this ‘fuel’ to ignite. When the girls tried to escape they found that the exit doors were locked. In 1911 fire engines didn’t have ladders that extended to the 8th floor and above. The girls who worked on the 8th, 9th and 10th floors jumped to their deaths in scenes reminiscent of 9/11. There was a huge public outcry. 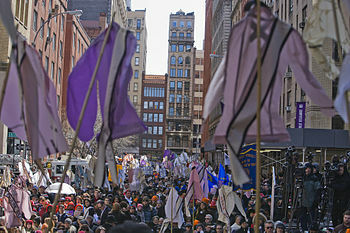 100,000 people marched in the funeral procession, and 400,000 people lined the streets to watch the coffins go by. Part of the protests of the Triangle factory fire. 1911. The first serious occupational health and safety regulations in the USA were introduced as a result. The Centenary of the Triangle waistshirt factory fire. New York 2011. In 2000 a fire broke out in the Chowdhury Knitwear factory in Bangladesh. Forty-six girls were killed. Many were aged between 12 and 14 years. Over 51 people died. When the investigators went through the charred remains of the factory they discovered that the fire escape doors were locked. This factory’s output was for American designers in the American market. From the Triangle Fire in New York to the Chowdhury factory fire in Bangladesh 90 years later, the circumstances of the fire are almost identical. 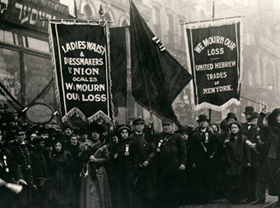 Fire exits locked, workers were predominantly very young women working long hours for a pittance in a deathtrap creating garments for the American market. They protested in Bangladesh as a result and I wish I could say that something came from this 13 year-old tragedy. Sadly since then, there have been many more fires. Adding to the depressing statistics is yet a second fire at the Chowdhury Knitwear factory in 2004 killing 23 garment workers. The figures below are even more stark. These are the deaths in fire accidents in Dhaka located garment factories, from 1990-2010. They don’t include the last three years, which have seen more fires and more deaths. Source: Research Reference Cell, Dainik Janakantha, The Daily Star, 27 February 2010, The Daily Star 15 December 2010, New Age 15 December 2010, and bdnews24.com 15 December 2010. These figures don’t include the deaths from the last three years including the disastrous Tazreen Fashion Factory Fire in November of last year where 111 garment workers were killed. It too was located in the suburb of Savar, Dhaka in Bangladesh. It’s been 112 years since the Triangle Waist shirt factory fire in New York. This story appears to be a never-ending one, certainly not one with a happy ending. It is the story of sweatshops, underage workers, no health and safety regulations, maximized profit, company greed on the backs of collateral damage namely charred and broken bodies. 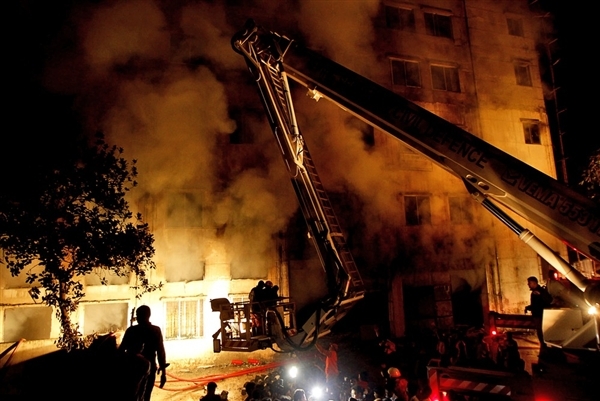 Posted in Food, Politics, Sport, Kitchen, Raspberry Howlers and tagged Balngladesh garment factory fires, Bangladesh sweatshops, Chowdhury Knitwear fashion factory fires in 2000 and 2004, fires in the garment industry, Rana Plaza garment factory fire in Dhaka, Tazreen Fashions factory fire, Triangle waistshirt factory fire. Bookmark the permalink. This post moved me to tears – in ways that the blur of mainstream news reporting consistently fails to do. If this were happening on the same scale in Australia, there’d be a huge outcry. We need to do more to pressure Oz shops to set higher standards for imported clothing. Outstanding work. It is a disgrace. The thing that sticks in my craw is how frequently this is happening. Those designers and retailers who do not sign the accord should be the subject of a consumer backlash. Enough. No more. Yes, it is the major buyers who have to be targeted, not the country of origin of the goods. International [global] standards are the key, policed rigorously by an organisation which knows all the tricks that manufacturers and the international retailers get up to, to flout standards that are set up. I stood beside the smoking ruins of one major building of those ten reported in 1996 in which some thirty woman and children died because the fire escapes were bolted shut. I spent the last fifteen years of my active university life going to Bangladesh and other parts of Asia researching women’s paid industrial and manufacturing work, women and child trafficking, and child labour. All of these are interlocked, and there are no easy answers. “Well, that’s it – I’m not going to buy another garment marked ‘Bangladesh'” is no solution. It’s the problem. All it does is make the first world consumer feel better about themselves. I grow tired of simple “solutions”. You rightly point the way to a beginning of solving the problem. Do not expect the cooperation of individual developing country government – it will want the critical foreign exchange earnings coming from the trade[s] and want to protect the local industry/industries. This is hardly surprising. This is very, very complicated. I don’t wish to blow my own trumpet but as many Australian tax dollars went into my research, I would like to indicate where people can access these articles to appreciate the complexity – the wheels within wheels. These are my articles. Denis Wright, “Sub-Contracting, Small-Batch Production and Home-Based Women Workers,” Amarjit Kaur and Ian Metcalfe (eds. ), Women and Work in Industrialising Asia: Costed, not Valued, London, Palgrave, 2004, pp. 129-148. Denis Wright, “Industrialisation and the Changing Role of Women in Bangladesh,” Asian Studies Review, Special Issue: Gendering of Industrial Work in Asia, vol. 24, no. 3, June 2000, pp. 231-243. Denis Wright, “Child Labour in Bangladesh: Recent Trends and Labour Standards,” South Asia Special Issue: Globalisation and Development in Bangladesh: Labour and Environmental Issues, vol. XXV1, no. 3, 2003. pp. 409-422. Many thanks Denis for including these references. It looks like more homework for me. I’m well aware there’s no magic silver bullet providing a simple solution to such a complex problem.You are correct. Solutions must start with those companies from the developed nations who maximise profits on the back of negligence and exploitation. The moves to an international accord are definitely steps in the right direction, even if they are baby steps. Thanks for the comment. I probably should have spoken to you before I wrote the piece. I was very cross.